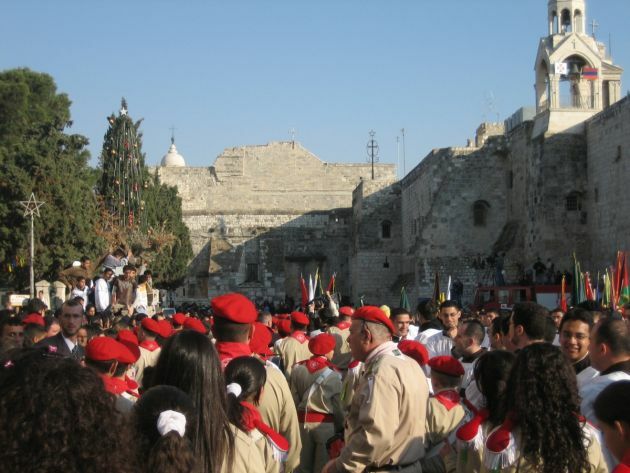 (Credit: Wikimedia Commons / Darko Tepert)Christian Scouts on Christmas Eve in front of the Nativity Church in Bethlehem on December 24, 2006. With Pope Francis visit to the birthplace of Jesus next week, the spotlight falls on the Christian population in the Holy Land which continues to decrease, with many choosing to flee economic and political plight. According to Reuters, the number of Christian tourists visiting Bethlehem and Jerusalem is growing as never before, all the while the country's Christian population are on a steady exodus. This follows a trend that has gone on for generations, as the Christian population has been on the decline across the Middle East, with the recent Arab revolts and increase of radical Islam only serving to accelerate the process. While Pope Francis visit to Israel and the West Bank on May 25-26 is hopeful to many local worshipers, doubts are cast on whether the visit can have any lasting effect on the Christian community in the region. Reuters reports that Arab Christians living inside Israel–since the nation's founding in 1948–has fared somewhat better than Christians in neighboring countries, such as Egypt or Syria. In Israel, the Christian population has increased from 34,000 to around 125,000 and has benefitted from a flourishing economy. Put into a greater perspective, however, the increase is low compared to that of other groups in the area. In the last year of British rule in 1947, the Christian population was 85 percent in Bethlehem, down to 20 percent today. In Jerusalem around 19 percent were Christian, down to 1.8 percent today, according to Reuters. In Israel GDP per capita is estimated to $36,000, according to the latest data in the CIA world factbook, while the surrounding Palestinian Territories are estimated at just $2,900. Christians in the two areas contend that the disparity and ongoing conflict is affecting not only their economic prospects, but also hindering freedom of movement. Among the reasons Palestinian Christians are emigrating heavily is that the group belongs mainly to the aspiring, often highly educated middle class. For them, it is relatively easy to blend into Western society and obtain foreign work visas, often sponsored by growing family networks abroad. In order to ease the plight, church leaders say they are doing what they can to help. For example, Catholics have helped build housing in Jerusalem, where construction permits are difficult for Arab residents to obtain. Other help comes in the form of education opportunities abroad, but with the condition that students return home after graduation, at least for a period. The Pew Research center released in its Global Christianity report (2011) estimates on the Christian population in the Middle East. This noted that the Christian share of the overall population in the region had decreased from 10 percent in 1900 to 5 percent in 2010. Most Christians in the Middle East are Orthodox Christians (65 percent, which includes members of the Coptic Orthodox, Greek Orthodox and Syriac Orthodox churches. Catholics are a minority with a total population around 2 million (27 percent). Other Christians in the region are Protestants (7 percent).